...Andy, again, visible through the windows of the intriguingly named Go Manila!. This has been here for a year or so by the Major of Major's Corner. You know, opposite the dead Odeon and by the public loos. Not perhaps the most auspicious of locations, then, and yet GM is super cosy, like a large back room squished full of chairs and comfy seating. Sofa, so fine. Limited savoury offerings today, but that's no bad thing. Hot paninis all round, ta very much. Pepperoni and tomato is good & crips & hot and, with a sneaky bag of Fairfield crisps and a cup of local dandalan juice, fills a gap and then some. Every spare space is taken up by assorted souvenirs from the land of Quezon and Aquino, occupying shelves and cabinets galore like a Western Pacific version of Oxford's Pitt-Rivers. To complete that comparison, there may even be a shrunken head in here. You could play I-Spy for hours, put it that way. Our window seats in the warm are ideal for people watching, helped along nicely by a half-decent coffee and shared slabs of choc 'n' orange and Toblerone cake. Service with a smile, too, though the lady in charge tells us she's still angling for staff training over in Manila. 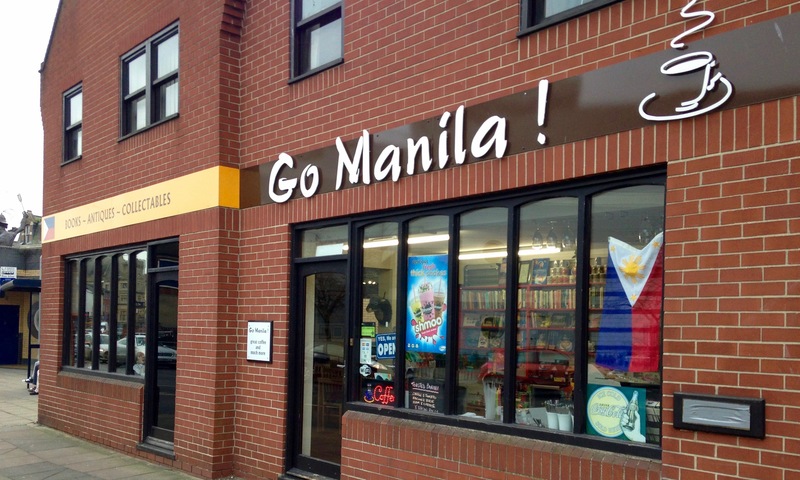 Great place to brush up on your Tagalog. If it was a car -- Toyota Camry. If they were passing by -- Tim Tebow.